StormFest 2018 is this weekend! Are you ready for the "Swag Bag Raffle"? | Badass Concert | Heavy Metal Music News | So METAL, we piss RUST! StormFest 2018 is this weekend! Are you ready for the “Swag Bag Raffle”? This weekend, April 13th and 14th, Clenched Fist Productions and a ton of sponsors are bringing you the action with this year’s annual StormFest concert event. It’s two nights of non-stop metal with over fifteen awesome local area bands. Speaking of “Storm”, isn’t the weather supposed to dump like six inches of snow on Western Nebraska? Who knows, because we will be partying it up in Omaha, aka Eastern Nebraska. This year, StormFest will be holding a raffle for the chance to win a glorious “Swag Bag”. Who doesn’t love free stuff? Well, close to free stuff. 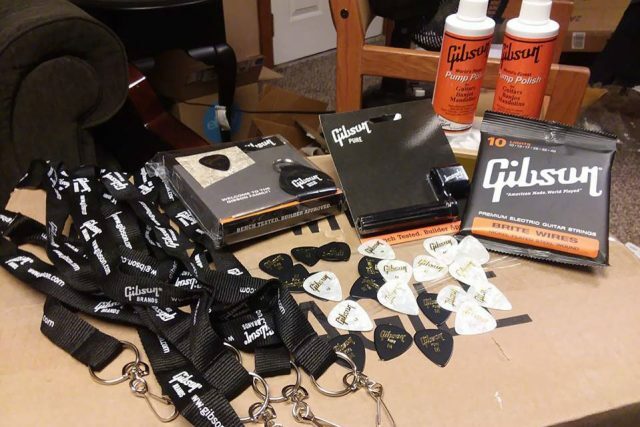 The Swag Bag will include items from Gibson Guitars, Highway Creepers Car Club, Dietze Music, band stickers, product stickers, guitar strings, CDs, guitar picks, koozies, guitar cleaning products, lanyards, CFP t-shirts, band t-shirts, and random things to make you say WTF! It’s a pretty sweet raffle. For more information on this year’s StormFest, visit the BadassConcert.com official StormFest page. This year’s StormFest is dedicated to the life and memory of our fallen friend and brother Cameron Ruble. Previous articleSaint Christopher’s REVENGE tour is coming up next month. I advise you to save the date. Next articleObituary’s North American 2018 Tour will feature Skeletonwitch and more.